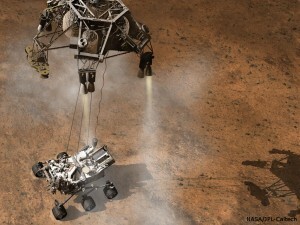 Artists rendering of Curiosity landing on mars with the sky crane. A new, enhanced version of Curiosity decent video has been created. The original NASA release was only thumbnails. This video is available in up to 1080p and it looks amazing. This is a dance routine by the Wrecking Crew Orchestra, a dance group from Japan. This video was taken at one of their performances of a Tron-Inspired routine. Its a pretty awesome concept and even better video. Well I just finished up Halo 3: ODST. Beyond that is spoiler territory. Click through to the next page for more and several videos. Stargate Universe premieres this Friday and if the trailer is anything to judge by, it will be spectacular. Give it a watch! Here is the official trailer for the much awaited Avatar movie that is due in theaters this December.